Breast cancer represents a significant public health challenge due to it being the most prevalent malignancy in females. The MCF7 epithelial cell line was isolated from adenocarcinoma of the human breast of a 69-year-old Caucasian woman in 1970. The MCF-7 cell line expresses estrogen, progesterone and glucocorticoid receptors. MCF-7 has various characteristics of differentiated mammary epithelium such as the capability of forming domes or ability to process estradiol via cytoplasmic estrogen receptors and is the most well-characterized and widely used of all the human breast cancer cell lines. MCF7 stands for Michigan Cancer Foundation – 7, the institute where the cell line was established by Soule and associates. The MCF7 cell line is used to create the CDX (Cell Line Derived Xenograft) MCF7 xenograft mouse model. 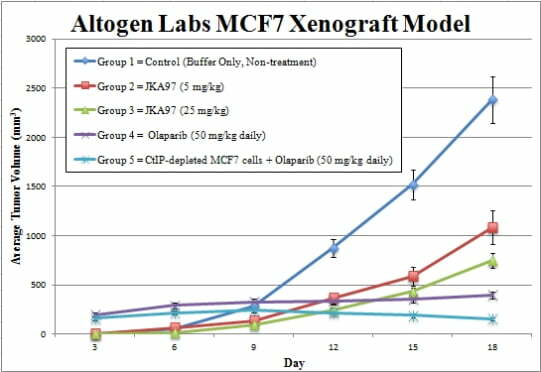 The MCF-7 xenograft model is positive expressing for the estrogen receptor (ER) and perpetuates studies to address cell death, apoptosis and mitotic arrest by chemotherapies (e.g. docetaxel). Examples of studies using the MCF7 xenograft model include the 2005 Clinical Cancer Research study (Brodie et al.) that explored combination therapy of tamoxifen with letrozole, a nonsteroidal aromatase inhibitor. They found that treating tumors with fulvestrant, an estrogen receptor agonist and antineoplastic agent, with letrozole was the most effective strategy for inhibiting tumor growth; the hypothesis was that tumor cells adapt to estrogen deprivation with letrazole treatment alone due to the increase in mitogen-activated protein kinase cascade levels of letrazole-resistant growths. A 2010 study (Fleming et al.) used a MCF7 xenograft to study mammary cancer mouse models and differences in tumor phenotype with varied microenvironments; they observed that DNA methylation status, vascularization and tumor growth/volume all varied depending on implantation technique (renal capsule, orthotopic, subcutaneous). Lastly, a 2008 study (Wu et al.) examined the effect of caveolin-1, a protein implicated in mitogenic signaling and oncogenesis, overexpression on MCF-7 xenograft mouse model; they presented novel in vivo evidence demonstrating the function of caveolin-1 as a tumor suppressor and not a tumor promoter as previously believed. Flasks are maintained at conditions of exponential growth prior to collection. MCF7 cells are trypsinized and trypan blue is used to determine cell viability. A minimum of 98% cell viability is required to begin the animal study. Cell suspension density is adjusted prior to injection. 10 to 12 weeks old NOD/SCID mice receive a s.c. injection of cells in the flank of the hind leg. One million cells (in a vol of 100 µL) of the Matrigel (50%) and MCF7 cell suspension are injected. Palpation (three times weekly) of injection sites determine start of the study. Tumors are measured (digital calipers) until reaching 100-150 mm3. Animals are placed into treatment groups according to the treatment schedule. Daily tumor measurements and mouse weights (3 times weekly) are recorded. Animals are euthanized as tumors reach 2,000 mm3 (or predetermined size limit per approved IACUC protocol) and necropsies are performed per study plan. Tumors are excised from animals and weighed. Optional digital imaging of tumors is available. Tissues are collected for downstream analysis and can be frozen in LN2, submersed in RNAlater reagent or prepared for histology. Xenograft animal models are used to assess the effectiveness of experimental test compounds against specific types of cancer. New medicines are tested on staged tumor growths that have been engrafted via subcutaneous or orthotopic inoculation in an immunocompromised mouse or rat model. All clinically approved anti-cancer agents have been evaluated with conventional preclinical in vivo models. Xenograft studies can be highly complex, starting with the selection of the appropriate animal model, choice of tumorigenic cell line, administration method, dosing, analysis of tumor growth rates and tumor analysis (histology, mRNA and protein expression levels).